Two recent poetry publications emanate from far western New York State. 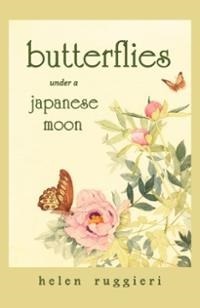 Unlike her earlier work that draws on details of her life in Olean, NY, Helen Ruggieri's new work, Butterflies under a Japanese Moon presents 65 poems plus 42 haikus drawn from her extended stays in Japan, especially at Yokohama College. Butterflies... is handsome book, with illustrations by Angela Mele. Ruggieri has been a university teacher and is an experienced and dedicated writer. Butterflies... is best understood in light of Ruggieri's other writing, published in hundreds of magazines as well as books and chapbooks. Her attention to and expression of detail is especially valuable in this book for the depiction of a culture that is foreign to most of us but fascinating in its expression of deep historical roots. The book divides into "Yesterday," Today" and "Haiku for the Year" sections. Ruggieri the poet functions at once as tourist, tour guide, historian, and bridge. As David Budbill remarks, "It's refreshing to read someone who won't Romanticize some other culture and looks bluntly at its brutalities; someone who can see beauty, honesty and cruelty all at once...." She remains open to the experience of literary Japan, as set in a modern industrialized Japan, and provides us with a feeling of the place and people. For those interested in the entanglements of East and West, Butterflies... is an important addition to an already rich literature. She takes up where Lafcadio Hearn's Kwaidan, Kenneth Rexroth and Cid Corman left off. The poem evokes a nice feeling with its short phrases playing off one another, until at the end, it re-arranges the words of the title, working again the hearing/playing/listening that characterizes not only the best musicians but the best poets too. It's a surprise to find Helen Ruggieri, who usually gives us views of grimy Olean, NY, a depressed former railroad town like Bradford or Pittsburgh, PA, dealing in ephemeral Japan. On the other hand, Bill Pruitt finds his connections to the greater world, as he usually has, squarely in Rochester, NY and the Finger Lakes. Who could devise a more homely, prosaic title than Walking Home from the Eastman House? How many poets live within walking distance of the Eastman House? Pruitt's new volume functions almost as a selected poems, not that he's selected work that's appeared elsewhere but that the poems he selects for Walking... represent a long period of listening and writing. Pruitt gives us 67 poems, arranged in four sections: "Way Back When", "Nothing Works", "Universe Problem Solved," and "The Very Thing that Saves Us." Just reading these section titles in sequence gives us a fair idea of what's up with Pruitt. We know that there's a process underway. It sounds as though it involves learning. There's a story to it. Once we know that Pruitt has a long history as professional storyteller, that shouldn't be a surprise. In "Way Back When" he seems to be acclimating himself to life in Rochester. He's got a poem about his dog, to his cat, about a bag lady, and maybe a couple poems about growing up in St. Louis, MO, as he did. The section ends with a meditation at a beach on Lake Ontario, so he has arrived. I'm so discriminating, it's a wonder I can even take a breath. He also rants a little, as in "Bush America" but of course we all managed to live through that, so what more's to say but "Turn it around." In "The Very Thing That Saves Us'" Pruitt presents us with both the title poem of the section and the book as a whole. Each is a typical Pruitt poem: "Walking Home from the Eastman House" is a warm night, street scene in which the poet watches through a window as others talk, but cannot hear them. 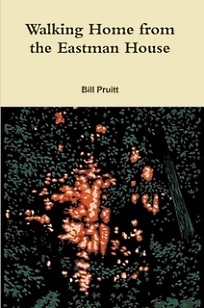 "The Very Thing That Saves Us" is a poem that begins to be about an encounter between friends but then turns dreamy when the poet writes, "it turns out while I was gone, you died...."
I think the third-to-last poem of the book represents Bill Pruitt as poet pretty well. Lovers lying in houses with one light on late. To cross the light years into someone's being. In which case you know this is it.